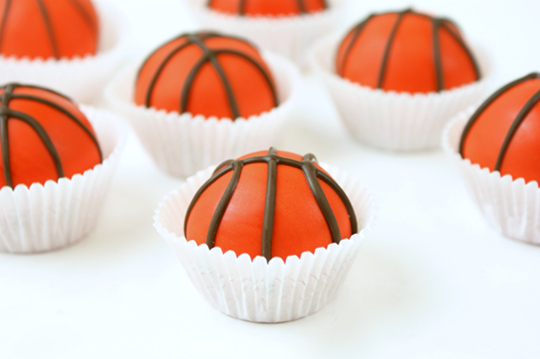 Basketball + cake balls = Win! 4. Melt Vanilla CANDIQUIK® in Melt and Make Microwaveable Tray™ according to directions on package. Add orange food coloring until a deep orange color is established. 5. Dip cake balls in CANDIQUIK® and place on wax paper to set. 6. Melt Chocolate CANDIQUIK® in Melt and Make Microwaveable Tray™ according to directions on package. Pour into a piping bag (or plastic bag with a tiny corner snipped off) and pipe on basketball lines.